From Mexico to the United States and Ecuador, indigenous uprisings inspire fear in the nation, which in turn sees itself forced to redefine its current formation. National projects expire, but peoples’ resistance continues, regardless of the form the state takes. Indigenous protest sporadically reaches the national stage and haunts the nation. Throughout Abya-Yala [America], indigenous aesthetic interventions, like dances, story-telling, gardening, and other practices of re-existence, seek to indict bad governance and localize other forms and meanings to ensure local communities outlive liberal and neoliberal national formations. 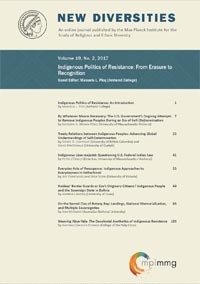 Although indigenous resistance is socially and culturally encoded as eruptive, peoples have resisted the long night of coloniality all along, although indigenous resistance has been considered isolated incidents and not formative moments of the nation-state, peoples have resisted the long night of coloniality all along. Their common struggle for autonomy and self-determination also seeks good living with Nature. By comparing the Zapatista, Lakota, and Amazonian struggles to protect land, water, and life from each settler nation’s liberal beginnings into the neoliberal present, I show how these seemingly “isolated incidents” fit into continental patterns of indigenous solidarity. I weave these three examples to explore how indigenous peoples use decolonial aesthetics to defy conceptions of territory, property, and governance.